MDG Advertising has launched a booking engine page that allows visitors to plan a stay at The Seagate Hotel & Spa in Delray Beach, Florida directly on the resort’s Facebook page. Now, visitors can book a getaway at the luxury boutique resort without going away from their Facebook activities via this special social media-based booking engine that allows the entire booking transaction to be completed on the social platform. Our social media team launched the booking engine with an exclusive fan-gated offer available only to visitors who have “liked” the Seagate’s Facebook page. In addition to reserving their rooms, visitors can share the booking page, as well as the exclusive offer, with their friends through their social networks. This social media promotion enables the hotel to take advantage of the power of social networking to broaden their fan following to a larger, yet targeted audience. While the customer benefits from the special offer, the hotel reaps the rewards of the social endorsement from customers sharing the information. This is a prime example of the value of social commerce, which is the use of social media to facilitate a brand’s e-commerce activities. The popularity of social commerce on Facebook has led to the industry term, “Facebook commerce,” to describe a brand’s online sales opportunities directly on their Facebook page. 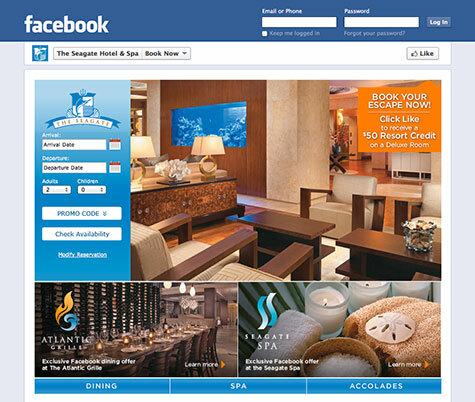 To discover the convenience of using social media to book a vacation or reserve a room at The Seagate Hotel & Spa through this Facebook functionality. Don’t forget to “like” the page for an offer you’ll love. 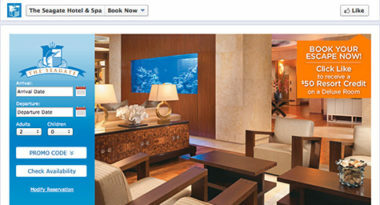 To incorporate social commerce into your hotel’s social media marketing strategy, contact MDG Advertising. At MDG, our 360° marketing approach uses just the right mix of traditional and online media to reach your hotel marketing goals. While some industries may fare better in print and others online, we strive to create a balanced approach where digital and traditional advertising efforts support each other and your marketing message is tailored to the medium. To stay on top of the latest hotel marketing trends that will make an impact for your property, contact MDG Advertising.